Turkish President Recep Tayyip Erdogan on Friday said Saudi journalist Jamal Khashoggi’s killing was ordered at the „highest levels“ of the Saudi government and is calling on Riyadh to be more cooperative moving forward. Critics say Erdogan is also part of the problem, however, and are urging him to formally request an independent UN investigation. Amnesty International, The Committee to Protect Journalists, Human Rights Watch, and Reporters Without Borders have all called on Turkey to ask the UN to intervene. But critics say the Turkish leader is also part of the problem, and that neither Turkey nor Saudi Arabia have been particularly transparent since Khashoggi disappeared one month ago on October 2. Erdogan went on to accuse Saudi officials of continuing to „cover up the murder,“ decrying the Saudi public prosecutor for refusing to „cooperate with the investigation and answer even simple questions“ during a recent visit to Istanbul. The Turkish leader is correct the Saudis have not provided answers to basic aspects of the case, such as where Khashoggi’s body is. The Saudis have shifted their narrative on Khashoggi’s killing multiple times, but recently admitted it was premeditated. With that said, they’ve not revealed who ordered the killing. The Saudis have also arrested 18 people in connection with the case, but are refusing to extradite them to Istanbul where the crime was committed. Istanbul’s chief prosecutor earlier this week expressed similar frustrations to Erdogan over these factors, and Saudi Arabia does seem to be evading and stalling so that the world will forget about Khashoggi and stop pushing for answers. Khashoggi’s killing is widely suspected to have been orchestrated by Crown Prince Mohammed bin Salman, the de facto ruler of Saudi Arabia. This incident has already been a major crisis for the Saudis and placed strains on its relationship with the US. But if it was proven without question that Prince Mohammed ordered the killing, it would be beyond calamitous for the kingdom and the consequences would be immeasurable. Some experts have contended Prince Mohammed could even face charges under international law. But others warn nothing concrete will happen until there’s a transparent, independent investigation. Sherine Tadros, head of the UN office for Amnesty International in New York, has been among the most vocal proponents of such an inquiry. Tadros recently told Business Insider neither the Saudis nor Turkey are genuinely interested in such an investigation, however, despite Erdogan’s attempts to appear sincerely disconcerted by Khashoggi’s fate. Over the past week, Turkey offered its most official description yet of the events surrounding Khashoggi’s death. Istanbul’s chief prosecutor Irfan Fidan on Wednesday said an investigation into Khashoggi’s killing concluded he was strangulated shortly after entering the consulate and subsequently dismembered. Prior to this, many of the purported details surrounding Khashoggi’s disappearance were a product of leaks from Turkish officials to local and international media. Some of these leaks have been contradicted by public statements some Turkish officials have made, which has made it difficult to discern exactly what happened. In this context, Tadros said the UN needs to be allowed into Turkey to conduct an independent probe. The UN has repeatedly expressed a willingness to do so, but Tadros suspects Erdogan is not particularly fond of this idea due to his dubious record on human rights and freedom of the press. Permitting the UN to investigate the murder of a journalist on Turkish soil would set a precedent for future inquiries that could prove uncomfortable for Erdogan, she said. But for such an investigation to happen, Turkey needs to write a letter to UN Secretary-General Antonio Guterres formally requesting a probe, Tadros said. The Committee to Protect Journalists, Human Rights Watch, and Reporters Without Borders have also called on Turkey to ask the UN to conduct an investigation. 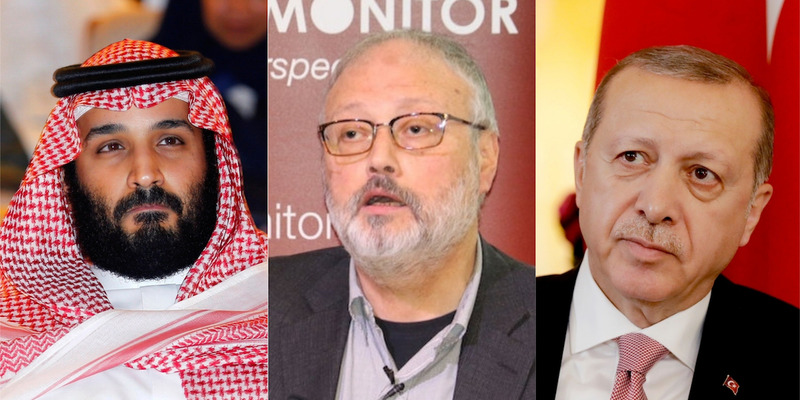 And more than 100 prominent writers, actors, and activists signed a letter this week calling for the UN to launch an independent probe into Khashoggi’s death. Erdogan is complaining that Saudi Arabia is impeding a legitimate investigation by not cooperating with Turkish officials, but by ignoring widespread calls for him to formally request a timely, independent UN probe he’s arguably guilty of the same thing. The Turkish leader in his op-ed for The Post claimed his government has „moved heaven and earth to shed light on all aspects of this case.“ Based on the limited details Turkey has officially released and the lack of an independent investigation, this is a bold statement. Turkey on October 23 said it would cooperate if the the UN and international bodies call for an independent probe into Khashoggi’s death. The UN has done so repeatedly, so the ball is in Turkey’s court.